Pai is a small place located in a picturesque valley, 136 Km north of Chiang Mai. The town offers a relaxing atmosphere with lots of tourists, especially backpackers. There’s quite a mix of people that you can meet there: there are western and eastern smiles, old hippies, Rastafarians and artists, and many others. I know that these words strung together don’t say much, perhaps they even sound strange, however I can assure you that they give the place a unique touch, maybe not so local and traditional, but always something special. I recommend that you visit Pai during the low season since it could be complicated finding a place to stay between the months of October and February, which is during the dry season. There are though about 350 guest houses and hotels and a high level of Westernization, and you can find simple accommodations in bungalows spread about the fields and along the river, as well as the many farms in the area. To get to Pai you’ll have to be ready to face 3 hours of curves, 760 curves and reckless drivers. Joking aside, driving in this area is never all that peaceful, and I invite you to take a bunch of pills to prevent car-sickness. Are you ready to get lost in Pai? How to get to Pai? There are regular buses and minivans that leave every hour from the central station in Pai, heading to Chiang Mai and vice versa, for a price of 150 Baht. The first bus leaves at 6:30 in the morning and the last at 17:30, but I’d recommend that you handle things personally onsite. There are also pickups that can accommodate 12 people, which you can take from Arcade Station in Chiang Mai, like the minivans, but cost more, about 1200 Baht and are little more comfortable. If though your budget is extremely limited, every day there’s also a local bus that leaves at 7 in the morning from Chiang Mai going to Mae Hong Son, which passes through Pai for just 78 Baht, for a total of 4 hours (of craziness). In fact these buses are old and there’s a mountain to cross, but if it’s your first time it could be an interesting experience. There are lots of welcoming places suitable for all budgets. For example I’d recommend Twin Hut, just past the river, where, for just 150 Baht, you’ll have a field view bungalow, facing the sunset and with breakfast included, with the chance to choice among other succulent options. Here you’ll find different options for staying in Pai. What to do in Pai? Pai is an isolated town, so unless you decide to go there, you won’t get there by accident. In fact it’s unlikely that, while you wander around Chiang Rai, you’d come up with the idea to take a trip out to Pai. However it is quite probable that you’ll meet a fellow traveler that has just been there and will give you the desire to go yourself (that’s exactly how it happened to me). First of all, it’s in the middle of a beautiful valley, surrounded by hills where you can explore and abandon yourself to the sounds of crickets and geckos and other animals that you’ll eventually have the good fortune to meet. Around the town there are tons of waterfalls and natural hot water pools where you can take a dip and relax. In the center of Pai there’s a walking street, four streets that in the afternoon become pedestrian only, where there are lots of street food stalls and small cafès – which are excellent here – where you have an abundance of choice between food and drink, fruit shakes and Thai food, but not just that. Imagine all of this along a river, with a lot of tourists going back and forth in no rush and without a specific destination, because Pai is very touristy, but being only a village, always maintains a relaxed and peaceful tone that characterizes it along with a mix of spirituality. Just outside of Pai there’s a Japanese community, Moon Village, which organizes various evenings for the performing arts. The best thing about this area is the slow pace that is hard to find in the large Thai cities. Not to be underestimated is the art scene, which is of interest if you want to spend time here for reasons other than tourism. In fact, in the middle of Pai there are many concerts and all you have to do is take a walk and choose your evening. The Thai artists know what they are doing. There are also many art galleries, eccentric clubs decorated in an alternative style, cooking classes, yoga courses, artists and artisans, open mic nights, and bookstores everywhere (I mention this because you won’t find many of them in Thailand). What to see in Pai? There aren’t any particular attractions in town, but the recommendation is to take a walk and let yourself be transported by the good vibrations, using the town as a base for exploring the surrounding area. I suggest that you rent a motorbike, or bicycle, and in 7 days you can visit the whole area: follow a different road each day from the town center, in fact there are 7 of them. As I mentioned above, there are natural attractions of incomparable beauty around Pai. First there’s a canyon, 15 minutes from the town center, where you can admire an immense sunset. There will be lots of people around in between the canyon and cliff, but that’s what you do here. There are other waterfalls and natural springs where you can swim, relax and enjoy yourself; there are also vines hanging above the clear water and all around fields, rice paddies, corn and forests. If for example you like water sports, then you’ll definitely have plenty of opportunities to canoe on the river or go rafting. 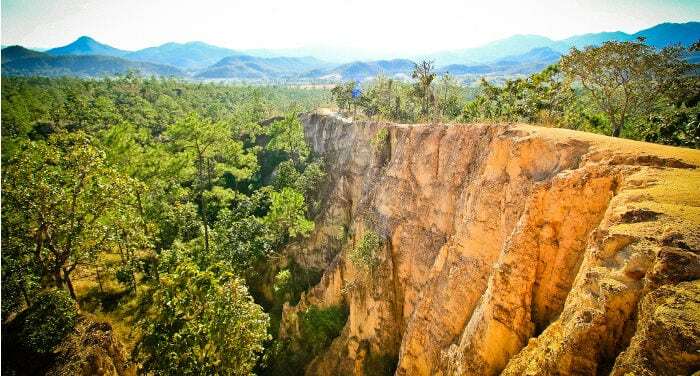 If you love the mountains you can’t miss taking an excursion to go trekking in Huay Nam Dang National Park, with the chance to camp and wake up in a field of clouds above the valley. Inside the park there are also the Tha Pai waterfalls. Another place that deserves a day tour are the Tham Lod Caves, a half hour drive outside of Pai, near Soppong. These are caves with many stalactites and stalagmites and findings from the Lawa tribe, going back millions of years ago. On the same route there’s also Kiu Lom viewpoint, a scenic viewpoint over the valley around Pai, and the Mor Pang Waterfall, a waterfall where you can take a dip. It’s worth it even just for the road to get there, a relaxing panorama without cars, a village every so often, both for the uniqueness of the place and the route. On the return I recommend that you stop to eat along the road at a place run by a cute woman who offers a buffet for just 150 Baht and for 20 Baht more allows you to take a swim in the “private” river. To sum up, Pai deserves the time and if you’re not in a hurry I recommend that you dedicate some for it.